At a recent book festival, I had the pleasure of sharing an author table with Carolyn J. Rose, a mystery writer living near Portland. Not only is Carolyn hilarious, she is a fellow Firefly fan and Wildcat, and she likes ghost stories. When she told me about her own encounter with the supernatural, I begged her to write a guest post for my blog. If you like mysteries, I highly recommend her Subbing isn’t for Sissies series. I’m currently reading No Substitute for Murder, which is about a substitute teacher who finds a body in a classroom. Carolyn’s writing is wonderful, and I absolutely love her sense of humor. Carolyn J. 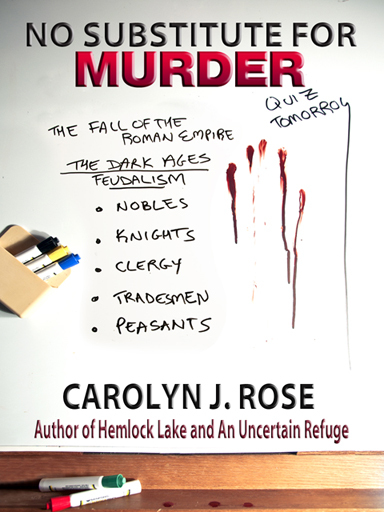 Rose is the author of the popular Subbing isn’t for Sissies series (No Substitute for Murder, No Substitute for Money, No Substitute for Maturity, and No Substitute for Myth), as well as the Catskill Mountains mysteries (Hemlock Lake, Through a Yellow Wood, and The Devil’s Tombstone). Other works include An Uncertain Refuge, Sea of Regret, A Place of Forgetting, and projects written with her husband, Mike Nettleton (The Hard Karma Shuffle, The Crushed Velvet Miasma, Drum Warrior, Death at Devil’s Harbor, Deception at Devil’s Harbor, and the short story collection Sucker Punches). 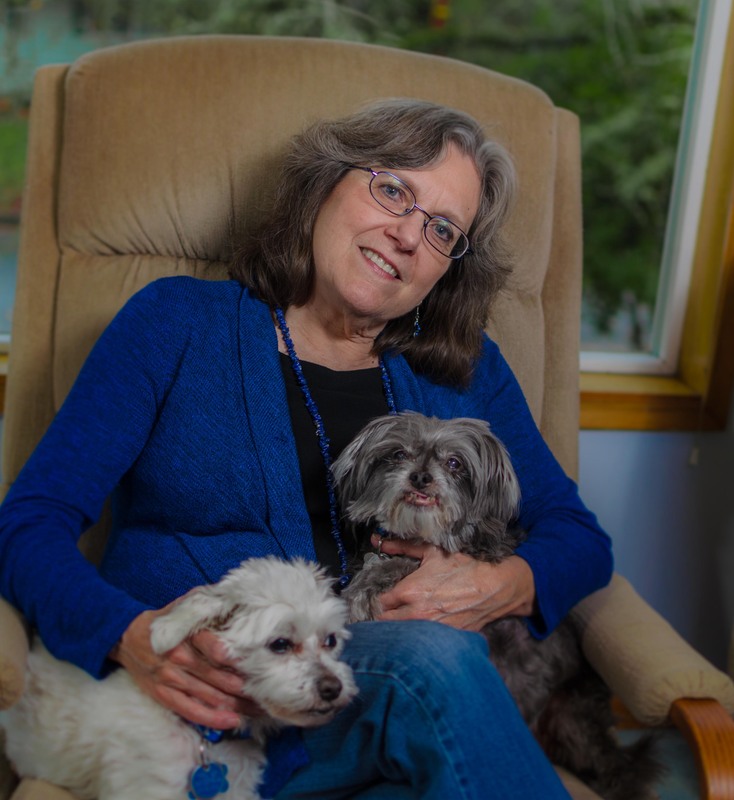 She grew up in New York’s Catskill Mountains, graduated from the University of Arizona, logged two years in Arkansas with Volunteers in Service to America, and spent 25 years as a television news researcher, writer, producer, and assignment editor in Arkansas, New Mexico, Oregon, and Washington. She’s now a substitute teacher in Vancouver, Washington, and her interests are reading, swimming, walking, gardening, and NOT cooking. I grew up in the Catskill Mountains in a tiny community my mother referred to as a hamlet. Bearsville is a mile or so from Woodstock, and a mile or so from what we called “forever wild” lands preserved by the state. That part of New York is famous for the tales crafted by Washington Irving, and my grandparents shared them all with me—the story of Rip Van Winkle and those chilling events in Sleepy Hollow. I had no trouble believing thunder echoing from the mountains was the sound of Henry Hudson and his crew bowling. I was certain those ancient hills were populated by all manner of ghosts. But I never saw a wisp of a spirit. Never heard a whisper from a wraith. Never detected the swish of a ghostly garment. Until I joined VISTA and moved to Arkansas in the early 1970s. During my second year in service, another volunteer and I rented an old house in Benton, a small city south of Little Rock. The house sat on a hillside beyond the home of the owners, a family that raised rodeo stock—goats, steers, and several bulls including a mammoth Brahma that once stuck its head through the window screen and into the living room. The house had three bedrooms, two along a short hallway, and one tacked onto the rear that could be reached from the outside, through the kitchen, or from the bedroom I used. That third room was narrow and without heat, so we used it only for storage. Someone else, however, apparently used it for more than that. More than once I woke in the night to see a strip of light at the base of the door. The first time that happened, I assumed my roommate had gone into the room for something and left the light on. I got out of bed, opened the door, and turned off the light. The second time I made the same assumption. After the third incident, I asked her what she’d been looking for in the back room late at night. When she denied being in the room for days, I checked the windows and outside door. All locked. I checked them again before I went to bed. Still locked. Later, when I woke to find the light on, I armed myself with a letter opener and checked again. Still locked. And no evidence anyone had broken in. The next day I stacked boxes in front of the outside door, moved my dresser to block the door from my bedroom, and leaned a broom against the locked kitchen door. I woke up deep in the night to find the light on. I listened hard, but heard no sounds of an intruder. I considered the possibility of an electrical malfunction, then ruled it out because the light never came on during the daytime or evening. That left a possibility that made the hair on the back of my neck stand on end. I pulled the sheet over my head and eventually fell asleep again. A few days later I came home in the afternoon to take a bath before heading to a community meeting. (It was summer with triple-digit humidity matching triple-digit temperatures. Darn few places had air conditioning, so we made liberal use of baths and showers.) While I was soaping up, I heard footsteps pass in the hallway. I called out to my roommate. No answer. The footsteps returned, coming the other way. I called again as they passed the door. No answer. I splashed off the soap, threw on my clothes, armed myself with a toilet brush, and burst forth. I saw no one. I found the outside doors all locked. The next day the dirt disappeared. My roommate—more of a homemaker than I was—had swept the kitchen but, while searching for the dustpan, realized she was late for an appointment. She leaned the broom against the wall and hurried out. When she returned, the broom was back where we normally kept it, and the pile of dirt was gone. Not long afterward, my roommate woke from a nap and found a woman standing nearby—a woman wearing a sunbonnet, a floor-length dress, and an apron. A few days later, I caught my first glimpse. She seemed to prefer to materialize in the kitchen in the early morning or late afternoon. Sometimes she appeared as little more than a faint image, like one retained after you stare hard at something and close your eyes. Other times the image was sharper. We asked the owners of the house if they knew they had a ghost. They exchanged sheepish glances and admitted they’d heard stories about the house before they bought it and had it moved to their property. They hadn’t realized the ghost would come along. Since then I’ve seen the Gurdon Light, and experienced a moving cold spot in a house in Eugene. If there’s a haunted tour in a city Mike and I are visiting, we try to work it into the schedule—Savannah was especially eerie. One sultry July night, we walked by the light of the moon through the Gettysburg National Cemetery on the anniversary of the Civil War battle. 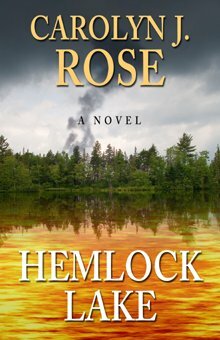 So far I haven’t caught a glimpse of another ghost, but I’ve written several onto the pages of Hemlock Lake, Through a Yellow Wood, and The Devil’s Tombstone, a trilogy of mysteries set in the Catskills. Thanks Carolyn! You can connect with Carolyn via her author page on Facebook, and don’t forget to check out her blog and her website, DeadlyDuoMysteries.com! This entry was posted on November 7, 2015 by Melissa Eskue Ousley. It was filed under Ghost Story and was tagged with author feature, Carolyn J. Rose, ghost, haunted house. As a semi-professional skeptic I never believed in ghosts. Until an experience at a radio station in Albuquerque where my production partner and I toiled in the wee hours, fueled by coffee and desperation to get a production done for a 9am meeting with a client. Carolyn and I, while still cynical about many things, do believe there’s something going on out there we can’t begin to understand. I agree, Mike. I’m skeptical of some things, but I’ve also experienced things I can’t explain. I’m intrigued by your radio station story. Maybe we’ll have to feature you on the blog next! Mike is a total skeptic. The first time I did a past-life regression he warned me not to return in period clothing that would have to be dry cleaned. But his ghost encounter shook his skepticism. It’s a great story. And a friend verifies it. Amazing experiences in that Benton house, Carolyn. That was a lot of ghostly activity–not just one knock-knock inflated out of proportion and probably a woodpecker. I’m amazed you kept your cool. Taking a bath and hearing footsteps is a Hitchcock moment. Yikes. I like the shadowy supernatural element you dust your stories with. The part about hearing footsteps while in the bath was chilling! That would have freaked me out more than anything else. And I REALLY want to hear Mike’s story.